Royyal Dog is a mysterious and complexed dude. 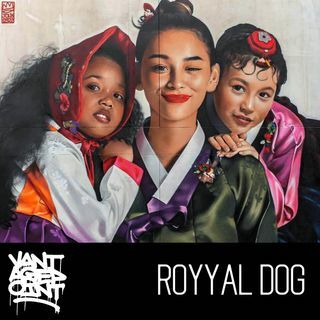 With his humble art beginnings as a graffiti writer in Seoul South Korea and a cultivated love of all things hip hop, Royyal Dog spends nearly all of his time these days traveling and painting intensely realistic portrait murals that mix hip hop imagery with his traditional Korean roots and a splash of Christian messaging... a combination unlike anything anyone else on the scene is doing and which sets him apart from the rest of the pack. His ... See More skill with a spray can is incredibly impressive but it’s his strong Christian faith that he feels makes him special. We were very pleased to have the chance to sit down with an artists as interesting as Royyal Dog while in Honolulu for Pow Wow Hawaii 2018.